You may be too young to remember, but Top Gun in the 80s was HUGE. We are talking Dirty Dancing huge, which is interesting, because both are fondly remembered but have failed to gain an audience with newer generations. Top Gun in particular seems to be known to the 90’s generation as “that gay movie.” There’s no need to spend time defending the film here, but I always think it’s important to set up the context of a certain title before I review it. 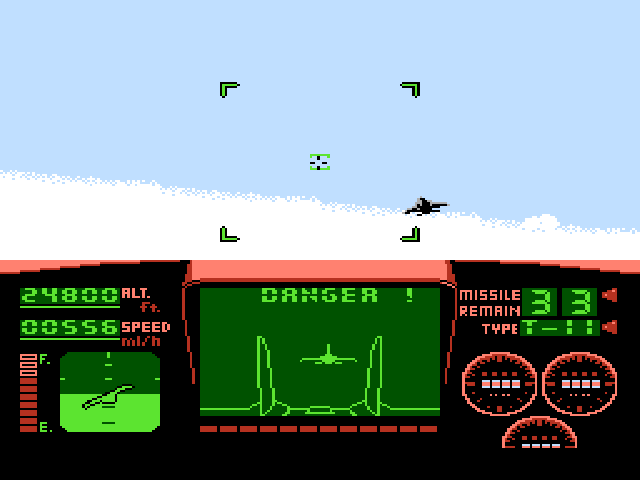 So when Top Gun for the NES was released, the movie and anything involving fighter jets were the top of the mountain. Bank hard (well, as much as the engine allows) to dodge incoming fire. I remember this game and Sega’s After Burner came out at practically the same time. A friend comes up to me saying “Get your quarters, we’re going to the arcade.” There, I am introduced to After Burner, and it was awesome. Maybe a week or two later that friend comes back (this was how you got your information before the Internet) telling me that they had released After Burner on the NES. We went to rent it at the video store and, come to find out, they hadn’t. It was this game he was thinking of, and this game couldn’t quite compare. 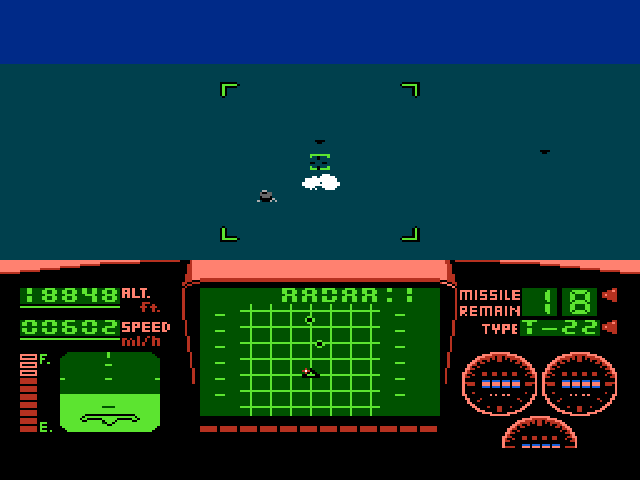 However, “a first person After Burner” is a fair way to describe the game. You’ll be fighting waves of bad guys within a restricted corridor, and dodging their fire as best you can. Unfortunately, the cockpit becomes a way, not to facilitate the experience of “being there,” but to mask the world’s lack of graphics. Much like Airwolf, you have a single color for the ground and a single color for the sky. Occasional puffy clouds give the sense of speed. Half the screen is taken up by an altimeter that means nothing, a fixed airspeed that cannot be changed, and three little gauges on the right that literally serve no function whatsoever. Enemies are 2D sprites that rush toward or away from you, firing guns that must be avoided and missiles that must be shot down. You won’t exactly fly the plane, and don’t have the capability to pull rolls or loops or any such aerial fun. You instead sort of nudge the nose (and the fixed crosshairs) onto bad guys and away from bullets. If you land the crosshairs on an enemy, you can take them out with a burst of gun fire from the A button. If you get them within a larger bracketed area around the crosshairs, you can hit B to arm and lock a missile, and B again to shoot it. The occasional bad guy will come up behind you and try to get a missile lock – in these cases you have to rock side to side to shake him. 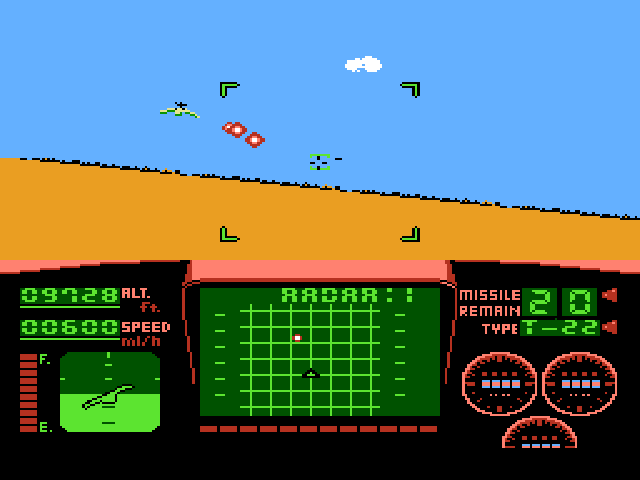 Waves come in vertical shooter style patterns, which the radar can clue you in on. Enemies flying toward you will almost always attack, and are the ones worth spending missiles on. Enemies flying away are no threat, and to my knowledge, don’t loop back around if you miss them. Your score is shown at the end of each stage, but survival is really the main challenge here. 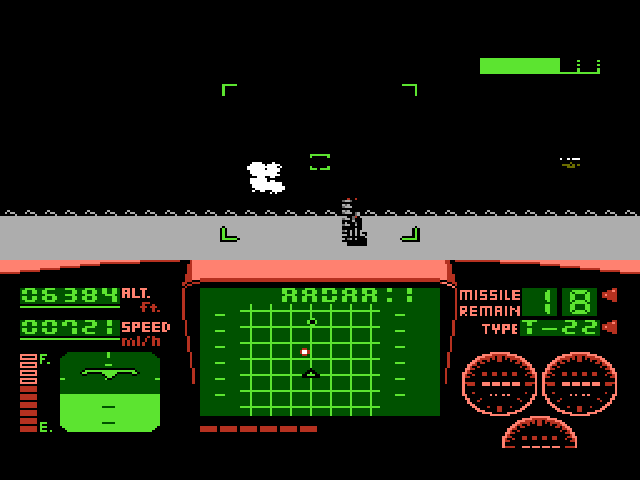 After the first mission, enemies and bullets are plentiful. You can take a few rounds, but missiles end you in one hit, and ground-based launchers love to throw these up at you. You have three lives for the whole game and no way to save progress. This is the “danger zone” you’ve heard so much about. Then there’s the infamous landing sequence after each mission. The general consensus is, and always has been, that landing the plane is impossible. 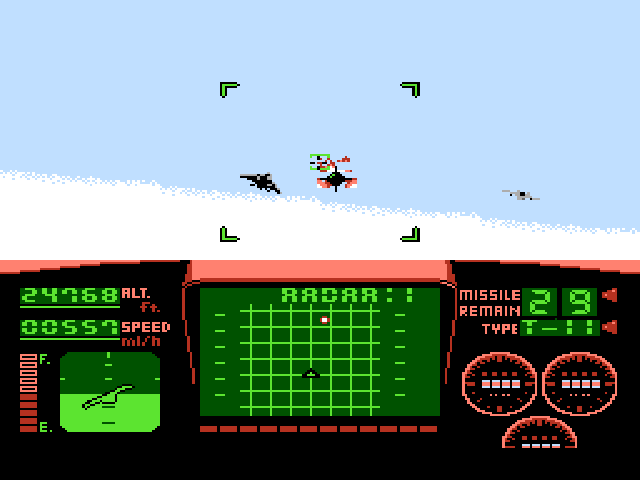 Here’s the situation: You’re flying along, shooting enemies that appear and making sure not to lose too much life. Then alarms start sounding, and suddenly, you’re now expected to fly the plane. The A and B buttons speed you up or slow you down, and the control pad moves you left, right, and tilts the nose. You’ll see the carrier in front of you and directions appear on your screen telling you to turn right, speed up, etc. But those instructions are frantic, and seemingly contradictory. They also don’t seem to cover the fact that your speed also affects your altitude, so “UP! UP!” may not be as useful as “SPEED UP!” Overall, forget the instructions entirely. See those numbers on the center screen during these sequences? Those are your targets. All you have to do is match that altitude and speed, using the indicators on the left. That’s it. Skip the frantic, confusing, often contradictory instructions you’re given, match those targets, and you’ll snag the third wire every time. If you miss the landing, you lose a life and the game goes on… until the middle of the second level. Levels from here out introduce sections where you have to hit Start to call for mid-air refueling – a maneuver Tom Clancy describes as “the most unnatural act two machines can perform.” You have to hold your plane straight and level as a larger tanker snakes a fuel hose out the back. It’s basically the same minigame as landing, with the same controls, except you’re trying to match the icon of the hose with the center of an X on your plane. This time, the radar’s instructions are actually helpful. However, you have a limited time. If you don’t hit the hose within about 60 seconds, the plane literally gives up and leaves you to die. Naval Aviation ain’t for sissies, boy! The greatest flaw is that there’s only four missions, which play identically. 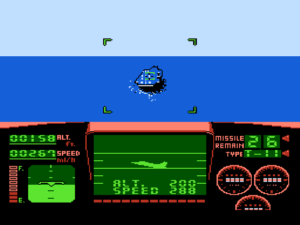 The first level is a “training mission,” so you only have enemy aircraft to deal with. The last three have you flying over the ground or ocean, in range of surface-to-air targets. These fire ridiculous volleys at you, to the point that you really shouldn’t go near them. Fortunately, all you have to do is point the aircraft at the sky. You’ll stop climbing at 30,000 feet, but the real idea is to keep the ground out of view – the game operates on the rule that if you can’t see it, it doesn’t exist. 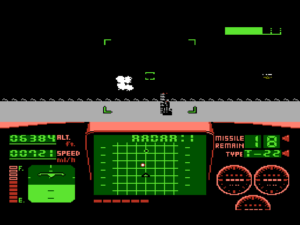 This is the same with any missiles or aircraft, and if you can mange to push them off the screen, then they just disappear. These three levels also require you to kill a boss at the end. This is a hardened target like a base or a space shuttle (yeah) that requires you to pound it with missiles and dodge AA fire before you fly over the target. These things take a lot of punishment, made worse by a minimum distance before your missiles will start locking on. The amount of air defenses means you’ll have to weave as best you can, though the incredibly narrow corridor you’re restricted to makes this extremely difficult. Even if you manage to throw enough missiles into the boss, you’ve still got to land the plane. It’s a pretty ruthless game. One thing that helps is that before each mission, you can configure your missile loadout between having a lot of weak missiles, a few strong missiles, or split the difference. The large numbers of weak missiles are great for fighters, but leave you in trouble at the boss. 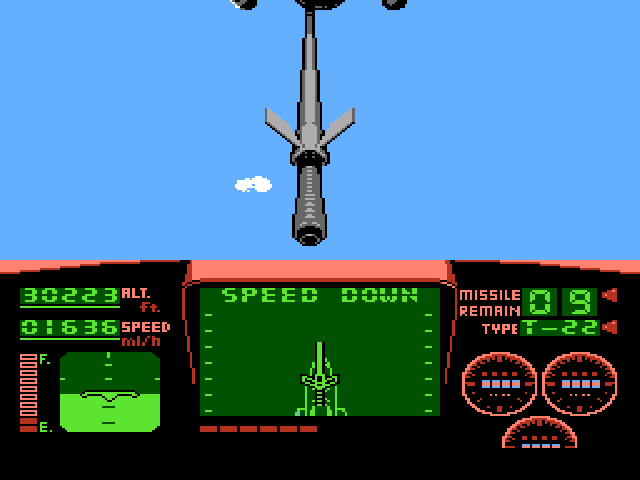 Conversely, if you take the strong missiles you’ll drop the boss easily, but only if you don’t fire them all at the airplanes. It’s a welcome piece of strategy that ties into your skills. If you can dodge like a champ, those heavy hitting missiles will really help at the end. The graphics aren’t bad, but certainly simplistic. 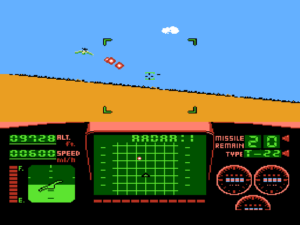 The utter lack of detail doesn’t help the illusion that you’re flying over anything, and the single colors make it look like a ColecoVision title. Luckily you’re never required to navigate – this is a corridor shooter – so lack of ground or horizon landmarks doesn’t matter at all. The clouds let you know you’re moving, the tilt of the horizon lets you know you’re shifting up or down, and you’ll even need to go through lengthy autopilot sections to break through the “cloud layer.” I definitely wish you could move around more, but this is probably the extent of what the NES can handle, and never meant to be a flight sim. You’ll need to be paying more attention to the brutal waves of fighters than the scenery anyway. For audio, the Top Gun theme is recreated quite well on the intro screen. It’s the only piece of music, and there’s nothing but effects in the game proper. These are about as good as they can be. Tire squeals, engine warm-ups, gunfire, and missile shots all sounding recognizable. Jets will “swish” as they pass you. Your own engines raise in pitch as you put more power, either in aiming for higher altitude, or directly in the carrier game. There’s nothing distracting, and the effects convey the needed info. Top Gun’s biggest flaw is that it features only four levels. As was the way back then, those levels are ruthless to compensate. 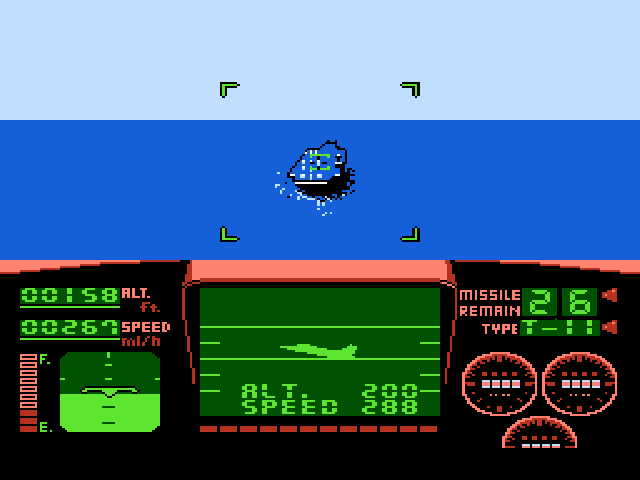 Making it through all four on only three lives, plus refueling and carrier landing minigames, and without “cheating” by pointing at the sky, is a challenge indeed. Whether you want such a classic NES challenge is what’s going to determine the value here. Plenty of action past the first level. The minigames actually do give some variety, and aren’t as obscure as they’re made out to be. Effects work well. Graphics are functional, but not impressive. Four levels are short, but the challenge is high to make up for it. Limited control over your plane. I wish one of those useless gauges showed your score instead.